This is definitely the way to go when you are building a 302 based engine “Stroke it once and you’re hooked.” The 347 with 480 HP engine has a 3.400 stroke where a 302 Ford has a 3.000 stroke which delivers an extremely high amounts of torque, you have to experience one to know how it feels. This engine package is what most of our customers prefer when building their hot rod. All our engines can be custom painted to match your vehicle at your request. We can also assist you in choosing the proper transmission and stall speed converter combination for your vehicle. Whether your vehicle is a Mustang, Fairlane, Thunderbird, or any 60’s muscle car at Proformance Unlimited we are here to help design and build the combination that best suits your knowledge level and over all experience, so your vehicle will out perform your expectations. Please browse our engine combinations listed below. Proformance Unlimited is best known for our precision custom designs. If you have any questions and would like Proformance Unlimited to build your next engine feel free to call Doug or Steve. 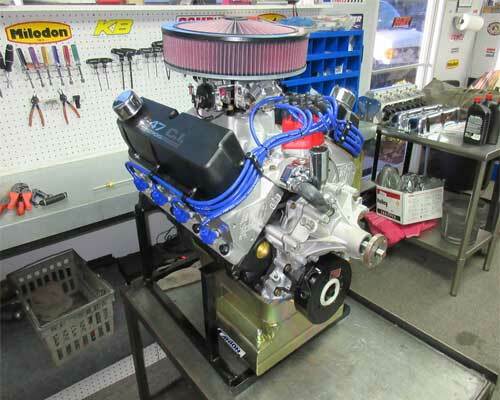 Small block 5.0L 302 Ford crate engine with aluminum heads. The 302 380HP engine combination can be custom designed to tailor to your specific needs. All engines can be custom painted to match your vehicle at your request. We can outfit your engine with the exclusive March Performance serpentine belt system. We can also assist you in choosing the proper transmission and stall speed converter combination for your vehicle and have it shipped directly to you as your performance crate engine is being built.